Plenty of travel writers and tour operators can be a bit snobby about the Masai Mara. It’s East Africa’s most popular and best-known park, with easy access from Nairobi and a plethora of cheap accommodation options. All this combines to make it sometimes seem as though the tourists here outnumber the animals. But I confess to a soft spot for the Mara – it was the first game park I ever visited, and I still remember the thrill of seeing my first lioness, spreadeagled royally in the middle of the road with a queue of safari vehicles lined up waiting for her to move on. The Mara’s game is, quite naturally, highly habituated to humans, which means it’s not unusual to see a hyena kill or something similarly thrilling before you’ve been there too long. If you’re short on funds you can find a group tour to the Mara out of Nairobi for a bargain price, and although the red-robed Masai tribespeople have almost become a cliché among images of East Africa, their culture is still fascinating and their ethnic group a force to be reckoned with in Kenyan politics. A visit to the Mara is especially worthwhile in July and August, when those well-travelled wildebeest and zebra and their attendant predators migrate up from the Serengeti and fill the plains to bursting. This famous park – a northern extension of Tanzania’s Serengeti – is responsible for perhaps more images of African animals than any other. And with good reason: it is chock-full of wildlife, and blessed with open terrain that makes game viewing easy. From August to November the park plays host to the northern leg of the famous Serengeti wildebeest migration (not forgetting the countless zebra and other herbivores that accompany them), which many consider to be the world’s greatest wildlife spectacle. There are also few better places in Africa to seek out all three big cat species in a single day. The downside of this popularity, argue purists, is high tourist numbers – and this is certainly Kenya’s number one destination for package safaris. But don’t let that deter you – especially if you are a safari first-timer. Certainly I saw a lot of minibuses crossing the plains during my one visit, but I also saw wall-to-wall herds, watched both lion and cheetah hunting, and enjoyed the unexpected bonus of a rare black rhino and calf. You can escape the hordes at the more exclusive camps, and on private concession areas around the western boundary, where activities such as night drives and walking safaris are also available. One warning: Mara River crossings do not happen with the punctuality that some TV documentaries might suggest, so count yourself lucky if you’re in the right place at the right time. Birders can expect rich pickings, especially in the riverine forest patches. There are certain moments in life when timing just works. I had timed my trip to the Mara for late September in hopes that I would be there for the great migration. It was difficult waking up at 4am but the promise of my first hot air balloon flight more than made up for it. With extraordinary luck, the wildebeest decided to start heading south that morning. As we floated above the earth in a basket, a long thin trail of animals plodded patiently across the golden grasslands for as far as the eye could see. The Masai Mara was first turned into a game reserve in 1948. Since then, the protected area has grown and shrunk again currently standing at 1,510 sq kms (583 sq miles). However it is part of a far far larger protected area, surrounded by private reserves and bordering Tanzania’s vast Serengeti National Park. Scenically, the Mara isn’t one of the most beautiful parks in Africa, although its huge skies and vast rolling plains have majesty. The word ‘Mara’ means spotted and refers both to the shadow patterns of the clouds chasing over the savanna and the occasional stands of acacia. What the open savanna does offer is superb visibility and huge numbers of plains animals, which, in turn, act as a fast food joint for endless prowling predators. The net result is that the gameviewing is good all year and magnificent between June and September when the great migration herds are in the north. The eastern half of the reserve which is closer to Nairobi, with more accessible roads (although most fly) is far more touristy than the west and has the large lodges. However there are clouds hovering as well as hot air balloons. A recent wildlife survey of the reserve has shown alarming drops in the density of some species, citing the pressure of tourism and grazing around the edges of the reserve. And park fees are now sky-high, even by Kenya’s astronomic standards. The Mara has priced itself out of reach for all but the super-rich and the once-in-a-lifetime dream trip. No wonder Disney chose to film African Cats in the Mara. This is Kenya’s finest big game reserve, 5,000ft above sea level and home to all kinds of animals, from six-tonne elephants to tiny dik-diks. 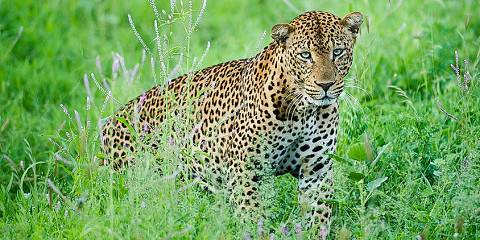 Cheetahs patrol its open grasslands and leopards haunt the shady forests beside the Mara and Talek rivers. But for me this will always be the land of the lion. I’ve been coming here since 1974 and the magic never fails. From the Siria escarpment to the Ngama Hills you'll find a score of prides, although the Marsh Pride of Big Cat Diary fame has been driven from its core territory as a result of illegal incursions by Masai cattle herders. Better instead these days is to head towards Sala's Camp on the Sand River, where the biggest pride in the Reserve hangs out. This is also the first part of the Mara to welcome the arrival of the Serengeti wildebeest migration - the greatest wildlife show on earth. June through October is the time to see it. Particularly beautiful is the Mara Triangle with its balanites woodlands and flat-topped inselbergs looking down into the Serengeti. A balloon safari from Little Governors Camp will show you the best of it. The only downside to the Mara is its popularity. With so many camps and so many vehicles, the tipping point is not far off. So my advice is to stay in the new private wildlife conservancies in the migration dispersal area outside the reserve, where tourist numbers are strictly limited. The Masai Mara is where the BBC’s Big Cat Diaries were filmed, and unsurprisingly it ranks as one of the finest reserves anywhere in Africa for big cat sightings. Above all, I associate it with lions: I’ve often encountered four or five prides in the space of a day here, and it is the only place where I’ve regularly seem prides of 20 or more individuals, and enjoyed the spectacle of lion mating. I’ve also yet to go more than a couple of days in the Mara without seeing leopard or cheetah, while other predators, notably jackals and hyenas, are also common. Other great things about the Mara include the spectacular wildebeest migration, which usually crosses into the reserve from Tanzania from August to October, the opportunity to see wildlife from a hot air balloon, and the scenery in the westerly ‘Mara Triangle’, which lies below the Oloololo Escarpment (part of the Rift Valley Wall). It is worth noting that parts of the Mara can become very crowded, especially during the migration season, so I always try to stick to the less crowded western art of the reserve, or – better still – one of the restricted access private Maasai conservancies that border it. Legendary Masai Mara is the most visited wildlife reserve in Kenya and it’s easy to see why. This 1,800 square km park supports a huge and diverse animal population and is one of the only places in the world where it is still possible to see vast herds of grazing animals. Attracted by the abundant wildebeest, antelope, buffalo and zebra are the predators. 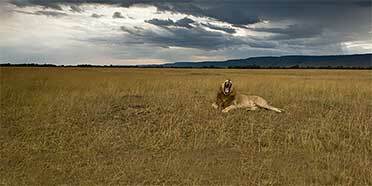 There are more lions here than anywhere else in the country, and leopard, cheetah, jackal and hyena also wander the grasslands. Far reaching views across open plains ensure that wildlife is almost never out of sight and it’s not unusual to see a dozen different species at the same time – all good news for big five enthusiasts! If at all possible, visit around August or September for the Great Migration. On my most recent visit we watched swarms of wildebeest thunder across the river on their way to greener pastures, with a few unfortunate souls trampled under foot, or picked off by a predator along the way - an unforgettable experience. Staggering wildlife viewing does come at a price and it’s not uncommon to see hordes of vehicles surrounding a pride of lions; but if you (or your guide) look hard enough it’s possible to find your own little piece of wilderness. Nowhere else sums up the East African dream like the Masai Mara. Always the best place in Kenya to see huge herds of grazers and a seemingly endless procession of carnivores big and small the Masai Mara is the one place in East Africa I could return to again and again and never get jaded or bored. Fantastic at any time, visiting the Mara during the annual wildebeest migration (roughly late June-October) though is to witness one of the undisputed wildlife wonders of the world. Of course there are some downsides. The Mara is the one protected area in Kenya that everyone wants to visit and the easiest way to find a lion is often to look for a group of minibuses. The park has a long history of mismanagement (it’s a national reserve rather than a national park which means it’s governed by the local council rather than the national government) and has long been in serious danger of being over developed (some would say this has already happened) with few enforced rules on lodge development and there is a real resentment from the local Maasai who live close to the reserves boundaries and who, watching a constant procession of safari minibuses heading to the reserve, know perfectly well how much money the reserve is generating for businessmen and politicians and feel that they are gaining nothing from it. I have frequently had Maasai tell me that they would just like to see the reserve ‘burn’. Fortunately, in the past year or so new laws and regulations have come in, the park management has been over-hauled and there are growing signs that the bad old days might be behind it and, I desperately hope, a bright, wildebeest filled future awaits! But, even with these negatives there is simply no other Kenyan park that comes close to matching the Mara and if the reserve itself weren’t good enough on its own then in the last few years things have got even better with the establishment of a number of private and community conservancies bordering the reserve. Visiting these conservancies can be very expensive (you have to be a guest of one of the very upmarket lodges to enter conservancy lands) but if you can afford it then these are the ultimate in safari indulgences. Each conservancy will have only a handful of other guests at any one time (several times I have been the only tourist present in a conservancy!) meaning there’s none of the minibus circus common in the reserve itself. The animal populations in the conservancies is phenomenal and increasing as more and more animals leave the reserve itself and head to the peace and quiet of the conservancies and, best of all, by and large most local Maasai, who feel they are finally gaining from the presence of wildlife and tourists on ‘their’ land are fully supportive of the conservancies. The conservancies have other advantages as well over the reserve itself. Walking safaris and fly-camping are allowed in all of them as is, in most cases, a certain amount of respectful off-road driving and vehicle numbers around any given sighting are strictly limited. All up these conservancies might well offer the best safari experience on the continent. At the end of the day though, whether it’s the reserve itself or one of the conservancies there is no other place in East Africa I would rather be. 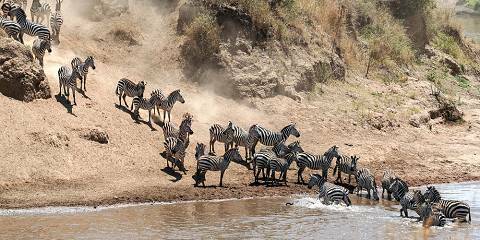 As neighbour to Tanzania’s Serengeti, the obvious attraction of the Mara is the chaotic migration of thousands upon thousands of wildebeest and zebra during July/August and then in October as they follow the scent of greener pastures. I was there in early August, with the wildebeest swarming like ants across the savanna, and was lucky enough to see frenetic river crossings as nervous wildebeest and zebra sensed crocodiles hiding in the shadows waiting silently to grab the bold or the vulnerable. Their arrival signifies a feeding frenzy for predators too and we frequently saw whole prides of lions, cubs included, walking slowly with swollen bellies, licking their bloodstained faces after the kill. But there’s much more to the Mara than the migration. Its sweeping plains are home to masses of animals that include the Big Five, although rhino are quite difficult to find, and its birdlife is tremendous. Unsurprisingly, it attracts masses of tourists too, catering for all budgets, so if you want to avoid the crowds, steer clear of the high season. Another tip for avoiding the crowds is to stay in one of the conservancies bordering the park. These are owned by local Maasai who benefit from leasing the land to just a few lodge owners. It’s a complete win-win situation – with only a handful of lodges on each conservancy, visitors get a great place to stay with few other tourists; the wildlife has returned to what was once deserted land due to overgrazing by cattle; and the Maasai get a welcome and not insubstantial income. I stayed at Naboisho Conservancy and was blown away by the amount of game on the plains. Grasslands dotted with graceful acacias, hundreds of big cats and enough natural drama to keep wildlife documentary film-makers busy year after year – the Masai Mara has it all. It also has some highly alluring and charismatic places to stay, perfect for a classic guided or self-drive safari. While it’s rightly popular, it’s never quite as crowded as the more accessible parks. If you only have the chance to visit the Masai Mara once, then it’s well worth visiting during migration season – the sight and sound of hundreds of wildebeest and zebra on the move and of predators weighing up their chances is something you’ll never forget. However, this is a park which delivers superb wildlife-watching at any time of year. There’s enough grass to support huge numbers of grazing animals and their predators. The Masai Mara will always be an extremely special place to me, as it was here that I had my first ever taste of a “proper” safari – and highly enjoyable it was, too. The Maasai Mara seems to be a place of constant drama. I can’t remember many drives on these vast grassy plains without something exciting unfolding in front of me. Of course most exciting wildlife viewings involve some predator activity and predators seem to be in huge supply. Some areas of the Mara get a lot of tourist traffic which takes away of the experience, but on the other hand, the predators seem so used to vehicles that you can really observe their behavior. They just go on as if you weren’t there. I’ve had a leopard using my vehicle as a cover to approach its prey. I’ve also seen a cheetah, which usually likes to sit on a termite hill to scan the surrounding plains for gazelles, sit on a car bonnet to do just that. Lions are often found hunting or on a kill. Any kill in the Mara seems to attract lots of scavengers as well. Hyenas and vultures are usually the first ones on the scene and jackals are never far off. All this drama carries out throughout the year, but the biggest spectacle unfolds around June-July, when the wildebeest migration arrives from the Serengeti. Predators, especially the opportunistic lions, seem to be even more prolific and this is the time of the year for the Nile crocodiles to get their fill during the famous river crossings. The Mara, a place of life and death, is no place for the softhearted. Kenya’s most famous and most-visited reserve was my first taste of African safari some years ago and in terms of game it was a great introduction. I saw the entire Big 5 on our first game drive and after a few days we’d seen so many lions I was beginning to get complacent. I wasn’t fortunate enough to see the Great Migration crossing the Mara River, but there were vast herds of wildebeest all over the place, hence, of course, the presence of so many big cats. The open plains certainly lend to the ease of game viewing, whilst the acacias and koppies complete the archetypal image of safari, but less alluring are the crowds. I got increasingly frustrated by the swift descent of countless vehicles on any good sighting, all jostling and competing for the best spot. Nevertheless, Masai Mara remains a great destination for safari virgins and those on a stricter budget. There are plenty of cheap and good camps as well as some of the more luxury offerings. Kenya’s recent terrorism problems have hit its tourism sector hard, so I would wager that the crowds in Masai Mara aren’t what they once were. This region of Kenya remains safe by most accounts, so there might be no better time to visit. Kenya’s best-known reserve, it’s everything you’d expect of an African wilderness area; rolling plains, rocky outcrops, and deep green winding rivers full of hippos and crocs. 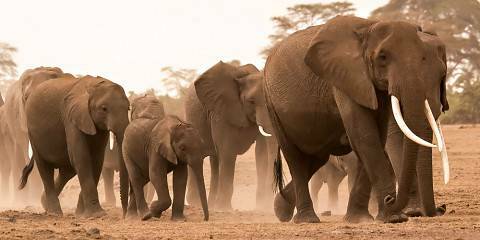 Its animal diversity is one of the greatest in East Africa and all of the Big 5 is easily found. However I find it can at times get overrun with tourist pop-up minibuses, and the bewildering amount of lodges and camps means that its ‘wildness’ may feel sanitised and the experience can be ‘package-holiday’ like. Nevertheless, you can’t beat the drama of the Mara – a massive migratory herd of wildebeest and their zebra friends marching across the plains, a cheetah making a mad dash through the grassland, a group of hyena squabbling over a carcass, or a hungry croc dramatically rising from the waters in the Mara River. Its popularity and appeal is also because the Mara offers a varied choice of safari options across most budgets. For a start you can either get there by air or road, and accommodation ranges from large family-friendly lodges in the reserve, super-luxurious and intimate camps in one of the conservancies or group ranches, to budget banda/tented accommodation outside Talek, Sekenani and Ololaimutiek gates. But whatever your safari arrangements are for the Masai Mara, you can be sure of plenty of dazzling animal action. Famed the world over for its magnificent wildlife, and site of the annual Great Migration, I had been looking forward for a long time to a safari in the Masai Mara. Massive numbers of grazers and browsers here support a huge population of predators and most visitors will have a wildlife sighting here that leaves them squealing in delight. The magnificent landscape did not disappoint – rolling grasslands and open savannah on an epic scale. Afternoon thunderstorms rolled over the Mara horizon and over the savannah when I was there in June – the light constantly dueling with the shadows as murky clouds covered pale blue skies. Doing a safari here however is a challenge. Safari company vehicles en masse illegally cross the landscape (off the official tracks) and race to the next big sighting (a big cat or rhino), and then surround and corral the distressed animal. In this regard, safaris have been turned into sport in the Masai Mara. The safety and wellbeing of the animals has been reduced from paramount to a thoughtless trade-off for trying to get a client into the best position for a photo. The thrill of seeing a pride of lions for example or a cheetah with its young is somewhat curtailed by dozens of vehicles all jockeying for the best position. My advice is to talk to your driver/guide before entry into the reserve and make sure they are aware that you want no part of this behavior. That is the best way to experience the magnificent wildlife of this very special place. Just cruising quietly through the grassy savannah – and who knows what you’ll come across and have all to yourself instead. Big cat country par excellence! Where else can you be following a lioness and her three cubs towards their luggah hideout and at the same instant see a pair of cheetahs sitting high on their termite hill lookout? The Masai Mara has everything within an incredibly short distance – it has been called the prime wildlife real-estate on earth, and I think that is not unreasonable. We even had the classic Mara scenario of having a cheetah use our Landrover roof as a lookout and I saw a full-scale battle here over a kill between a pride of lions and a group of about 30 hyenas! I have visited the Mara on several occasions (both at camps inside the park and at concessions on Maasai land on the fringes – where walking safaris and ‘controlled’ night-drives are possible). I have never been lucky enough to coincide my visit with the migration however (although I did see it in the neighbouring Serengeti). One day I will be back! My first safari experience was a tough act to follow. By day we spotted lions sheltering in emerald-green foliage and spent hours photographing a leopard napping next to the kill it had hoisted into a tree. By night, we were treated to a little Masai culture, with folklore tales and after-dinner dance performances. The Masai Mara is deservedly popular, with its range of accommodation to suit all budgets, its elegant and striking Masai people who sometimes work as guides and its plethora of animals that includes the Big Five and practically every other species you're likely to have on your checklist. Gorilla tracking is arguably one of the most rewarding wildlife encounters in Africa. Although chimps are more closely related to humans, gorillas seem to connect more to us as visitors. Nothing prepares you for being stared at by a gorilla. And that is exactly what they do: they seem to be looking at us as much as we are looking at them. I’ve been privileged to see gorillas in Volcanoes National Park about a dozen times, and each experience has been totally different from any other. One amazing experience was when the whole troop followed me down the mountain to the boundary of the forest after my time with them was up. Budget permitting, I can recommend booking two gorilla tracking permits on consecutive days. The one hour spent with these gentle giants might just feel too short. Keen hikers should stay on for a day or so to visit Dian Fossey’s research station or climb Bisoke Volcano. Tracking golden monkeys is also a worthwhile activity.